Combine ingredients in a blender and pulse for 15 – 20 seconds. Heat a small non-stick pan and butter it. Add 2 tbsp of batter to the pan and swirl to spread out evenly. Cook for 30 seconds and then flip, I mean actually flip, not with a spatula. Cook for another 10 seconds. Lay flat on a cutting board to cool. Spread Hershey’s spread down the middle of the crepes, top with sliced strawberries. 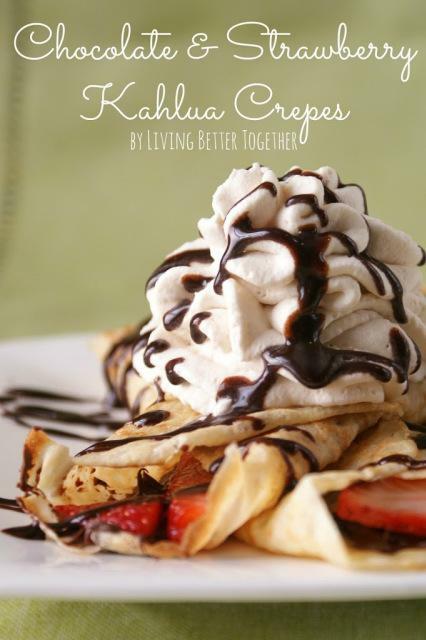 Wrap the crepe up and top with Kahlua Whipped Cream and chocolate syrup.